Recently, I had the fortunate opportunity to spend a peaceful week in the wooded solitude of Essex County, Massachusetts. The generous invitation came from a friend who owns a small cottage at the edge of Asbury Grove. The rear windows of the cottage face approximately 10,000 acres of forests and ponds between Hamilton and Topsfield. One of my favorite aspects about coastal New England is how the Atlantic meets with forests of pines and maples. Asbury Grove is in the Cape Ann region, northeast of Boston, and at the southern waters of the Gulf of Maine. The village community dates back to the mid-19th century, though amidst settlements from the early 1600s. “The Grove” has its roots in the camp meeting movement within the Methodist church, and the community continues as such- though without denominational restriction. 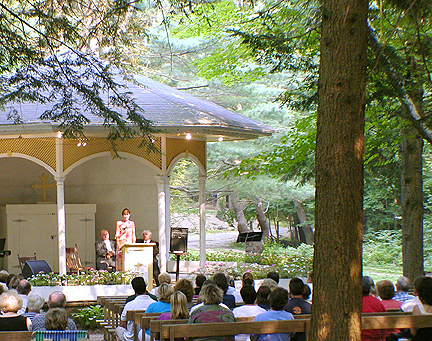 Asbury Grove is a living, historic site, including a chapel, library, social halls, a large tabernacle, and an outdoor sanctuary for community vespers. Every mid-summer, there is a week-long Camp Meeting of speakers and concerts. I arrived as the large meetings concluded and the Grove returned to its calm. Exploring some new surroundings, in the context of personal retreat, is always enjoyable. In these stressed and unstable times, my steps are puddle-jumps between pauses for respite. Changing my environment, even if it’s barely 85 miles from home, is enough to recharge- especially if the destination is one of good company and healthful solitude. The closer I navigated my way to the Grove, the narrower and more wooded the roads became. That’s a good sign. My last road on the way took a few sharp turns, before tunneling through intertwining tall trees. My abode for the week was a good fit, being at the forested edge of the Grove, providing enough solitude yet still moored to the community. The cottage has the look of a gingerbread house, with the basics for washing, cooking, and repose. I had to traverse sideways through the little doorway. The place was cozy and quiet by day, with vigorous accompaniments of crickets and owls by night. I got my wish of a good rainstorm midweek, and savored the sounds of a sheltered pelting. The best retreats include some wandering along paths and lanes, to accompany wondering musings. Taking to the circuitous roads of Cape Ann, I enjoyed loops of meandering lattices between small towns. From the Cape’s outer reach in Rockport, I navigated back to the Grove through Manchester-by-the-Sea, and Wenham- or through Ipswich. Between Rockport and Manchester is the old, famed fishing town of Gloucester. Below two: Hammond Castle, Gloucester. When a Mainer travels in Massachusetts, there is a combination of the sojourner’s admiration of difference, with a great sense of familiarity. My instincts understood the unmarked roads, and my tastes were at home with the pleasantly chatty greetings, strong coffee, and the malt vinegar on my fish and chips. I’d say that to really prize New England, it would help if you like things old-fashioned, such as drive-ins and railroad-car diners, grinders and moxie frappes, creaky houses and covered bridges, century-old ballparks, Shakers, camp meetings, and general asymmetry. If you don’t dare, as we say, well then you dassn’t. A perfect coffee at Zumi's, in Ipswich. At one of the outdoor prayer gatherings, I met a fellow who is a 3rd generation resident of the Asbury Grove community. He recounted some regional history among his very interesting recollections, and introduced me to another elder gentleman who later concluded the meeting with an eloquently-worded impromptu prayer. From the tranquil woods near South Hamilton, the older man prayed for refugees, for children, and in his familiarly-accented voice, for the Grove. With this sojourn now in the recent past, the late-summer is now evident. With the relief of cooler temperatures, the less-pleasant turbulence of ragweed pollen follows. But it’s that time of the year; the time that still reminds me of new school years and beginnings- even to this day. A great reward for graduates is to be able to continue savoring September and October as summer’s extra innings. Alas, the full time worker’s life is not divided into semesters or seasons, but I can resume seeking out retreats and sacred groves. Readers may recall my spring sojourn in the Berkshires, which serendipitously paralleled reading the adventure story, The Wind in the Willows. Massachusetts landmarks had similar names to those of the story, as I journeyed along the Housatonic River. To my surprise on Cape Ann, at the far opposite end of the state, I stumbled over a bookstore called Toad Hall! Looks like a beautiful and serene place. The perfect place for reading and writing. I miss my travels to Massachusetts and other places in New England. Florida is too far away (and boring).